Shaykh-ul-Islam Dr Muhammad Tahir-ul-Qadri, the founding leader of Minhaj-ul-Quran International (MQI), delivered his special address at the annual International Spiritual Gathering (Laylatul Qadr) held on the intervening night of the 26th and 27th of Ramazan here at the Itikaf City in Lahore. The mega event of the International Spiritual Gathering 2018 was attended by thousands of people of all ages from different parts of the country. 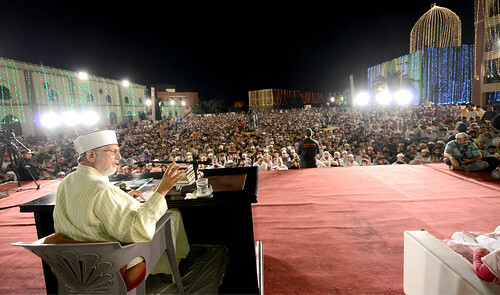 Addressing the thousands of the participants of Itikaf City on the occasion of Layalat al-Qadr in Township Lahore, Shaykh-ul-Islam Dr Muhammad Tahir-ul-Qadri has said that societies that celebrate and are founded on peace, love, human welfare and honesty remain alive while those imbued with hatred, corruption and usurpation of rights are destroyed. He said that Islam is a universal religion and a complete code of life and the pivot of its teachings is love, peace and human welfare without any discrimination of caste, creed and colour. Dr Tahir-ul-Qadri said that Layalat al-Qadr is the blessed night on which the revelation of the Holy Quran was completed. The Divine Book itself described the superiority that the Night of Power and Faith enjoys when it termed it as being exalted among the thousands of nights. The MQI leader said that every word of the Holy Quran is characterized by peace, love, promotion of harmony and human brotherhood and establishment of an egalitarian international society. He stated categorically that those who destroy peace, shed blood unjustly and create chaos in the land cannot be advocates of Islam. He said that there is heavy torment and severe accountability in store for them. Dr Tahir-ul-Qadri said that protecting the society from every kind of discord and upheavals is our individual and collective responsibility. He said that when justice is killed and rights are usurped, it leads to chaos in the land, stating that it is the responsibility of the state that it takes steps for elimination of injustice and unfair play. He said that if peace is our destination, then we will have to elect honest and trustworthy leaders to the positions of power for the management of the state affairs. Dr Qadri said that when the people with questionable conduct come into power, they take decisions on the basis of their likes and dislikes and play havoc with the peace of the society just to protect their vested interests. He asked every Muslim to study the teachings of the Holy Quran, stating that the Islamic world will have adopt the cherished values of moderation and balance. He said that the Holy Prophet (peace and blessings be upon him) emphasized these values in such a manner that he made them a basic principle for every walk of life and dissuaded his followers from showing extremism in life.